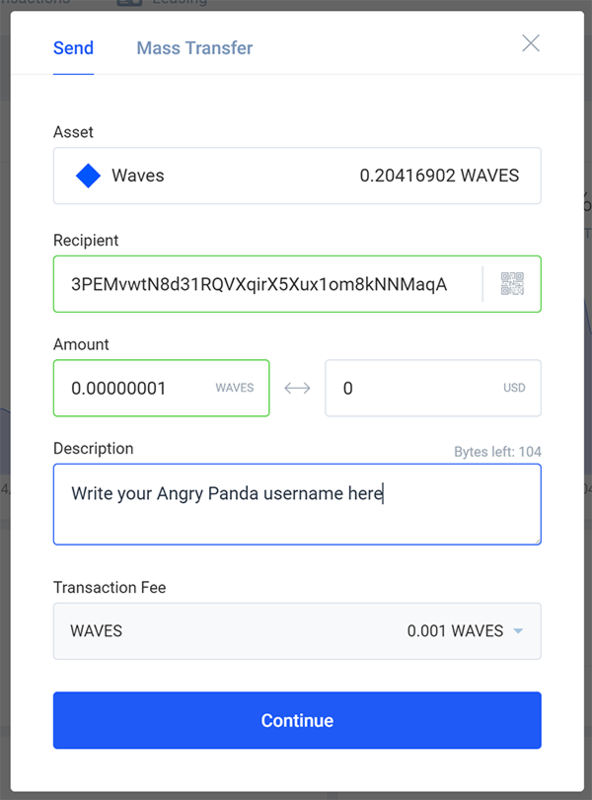 To earn token points and badges (ROAR, XPAND, UBEAR, EBEAR) or investor ranks, you must verify that you are the real owner of a Waves address to link it to your Angry Panda account. We will check the amount of ROAR, XPAND, UBEAR and EBEAR tokens you own and we will credit your points, badges and ranks. Repeat this procedure (steps 1, 2 and 3) whenever you want to update these points, badges and ranks. We will only register the amounts that will be increased, while we will leave the decreased amounts unchanged. For futher information feel free to ask here or contact us on telegram. Your Angry Panda username should not be entered in this post but in the payment description, otherwise we can’t verify your account. Look at the image in the first post, the description is below the amount.